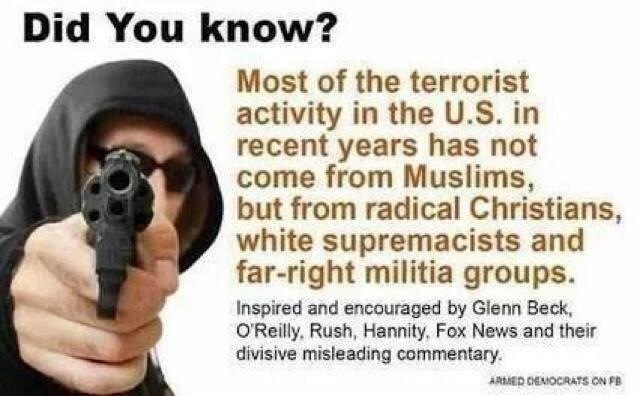 Hard to tell the difference between Christian Fundamentalism and Radical Islam. Thomas Jefferson said, Religious institutions that use government power in support of themselves and force their views on persons of other faiths, or of no faith, undermine all our civil rights. In 1983, (Marsh v Chambers) the Supreme Court ruled in favor of the practice of beginning a legislative session with a prayer delivered by a publicly funded chaplain. This set an unfortunate precedent for the current SCOTUS deemed most conservative in years and they ruled, once again, in favor of sectarian prayer (in a government setting) in this week’s Town of Greece v Galloway decision. When an Alabama judge recently asserted the First Amendment only applies to Christianity, the metamorphosis of our government from a non-secular democracy into a theocracy is now a reality. Five of the nine Supreme Court Justices were appointed by Reagan or one of the Bushes, and there is definitely a major shift to the right on most of their decisions. Scalia and Alito are essentially evangelical Catholics. Kennedy, Thomas and Roberts are not as vocal about their belief in the supernatural but are still very sympathetic to the whims of the religious right. It’s frightening to think the Republican Party is SEVENTY-FIVE PERCENT certain of their belief in “the Second Coming of Jesus Christ.” It’s chilling that a group of people so committed to faith over science also wield such enormous power. Chirac, blown away by the mind-numbingly superficial and fantastical beliefs of the U.S. President, wanted no part of a Biblical war. 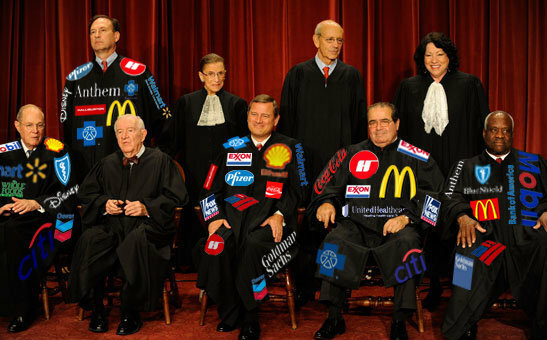 When the five conservative justices ruled in favor of unlimited anonymous donations (Citizens United and McCutcheon), the activist agenda of these corporatist justices erased any question of whom these men truly serve: The Koch Brothers and their Heritage Foundation underlings. Heritage asserts the Christian faith is under attack, and they’ve furtively ensconced their religion into local governments, Red State by Red State. In her dissent of the recent Town of Greece v Galloway, Justice Elana Kagan said, “…No one can fairly read the prayers from Greece’s Town meetings as anything other than explicitly Chris­tian—constantly and exclusively so. From the time Greece established its prayer practice in 1999 until litigation loomed nine years later, all of its monthly chaplains were Christian clergy.” If private citizens of a town are not Christian, they have no choice but to participate in prayers or face undue scrutiny from their fellow citizens. It is clear, Christian fundamentalists will fight longer and harder, with better organization and fervor than any other group. With limitless money, they are going after legal abortion, access to contraceptives and gay marriage. They insist upon the teaching of Creationism as science, and think it should get equal footing in our children’s schools. They are fighting on all fronts to make America resemble the “Great Satan,” Iran. Only difference, this theocracy may soon be ruled by the Draconian Old Testament.